I used 3 cake mixes for this PS3 birthday cake and had some left over. The PS3 box was two squared and then the remote was 1 single layer that I cut into the shape. Always cover the cake in whatever frosting you like before rolling out and covering with fondant and this will make the cake taste much better! Try to get the fondant as thin as possible for better taste too. I purchased Wilton Fondant in tubs from Michaels and get white and like to make my own colors but they sell it already made in some colors. Black might be worth buying since it takes a while to get it dark enough. Once you cover the PS3 game box let it sit a while to stiffen before carving in the details, will make it easier. The remote was super fun and easy and my son helped supervise me and I printed out a copy of what one looks like as a guide. Letters and numbers all cookie cutter and the rest done by hand like playing or sculpting with clay. Super fun! He loved this cake and so did his friends! 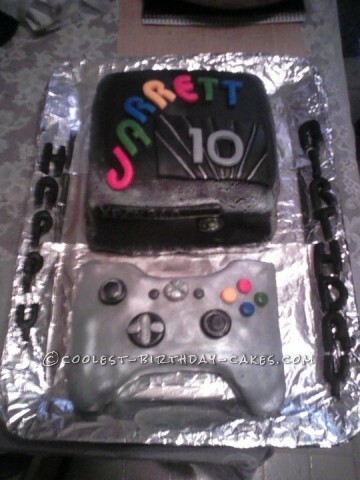 Birthday cake idea Posted by Bonnie F.
I don’t know if you realise but this is an x box cake.